Welcome to the Fit Small Business Xero training course! In this lesson, we’re going to cover how to accept online payments from customers in Xero. You can follow along on your own Xero account. If you don’t have one already, click here to sign up for a free 30-day trial and follow along below. To complete this lesson, you can either watch the video below, read through the step-by-step instructions, or do both. Let’s begin! For some small business owners, Xero will provide enough tools to handle their books all on their own. But, for many, it makes sense to use Xero in conjunction with experienced small business accountants who are also Xero experts, like those at Bookkeeper360. Bookkeeper360 can handle your monthly bookkeeping, payroll, new employee paperwork, taxes, and more. Basic plans start at $249/month. Get your first consultation free. Why Is It Important to Accept Online Payments from Customers? As we discussed in the accounts receivable aging report lesson, it’s very important to stay on top of the money that your customers owe you, known as your accounts receivable balance. By giving your customers the option to make payments online, you will get paid much faster. This saves you time you would normally have to spend chasing after customer payments, and helps mitigate cash flow issues resulting from payment delays. In this lesson, we will show you how to connect a payment service to Xero so that your customers can make payments online directly from their invoices. Note: If you have customers who live in another country, you can even accept payment in a foreign currency. Be sure to watch our How to Set Up Multi Currency video tutorial for step by step instructions. Invoice created in Xero with a Pay Now button for customers to make payments online. How Do I Connect a Payment Service to Xero? The first step to accepting online payments from your customers is to connect a payment service to Xero. 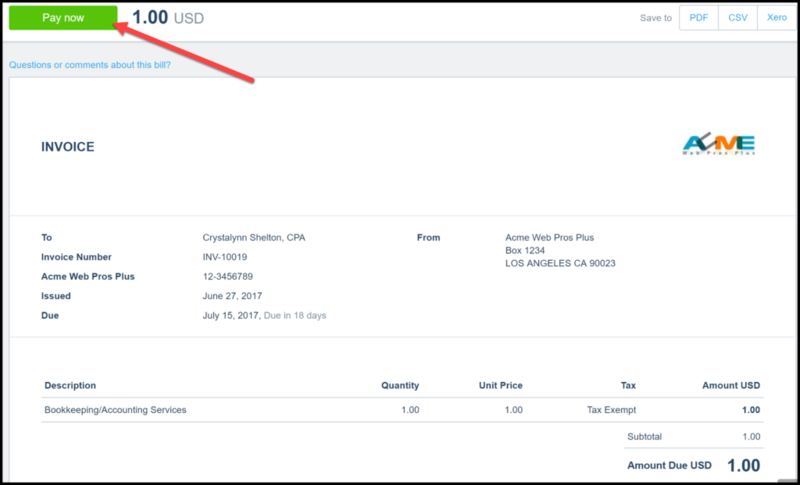 Using our fictitious company, Acme Web Pros Plus, we will show you how to connect a PayPal account to Xero. Follow the steps below to connect a Payment Service to Xero. 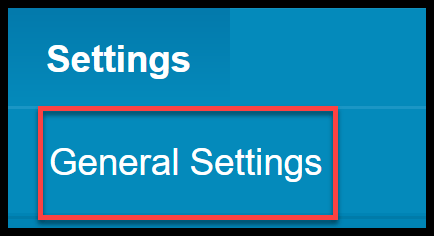 From the Settings menu, select General Settings as indicated in the screenshot below. Scroll down until you see the Connect section and click on Payment Services as indicated in the screenshot below. Navigate to Payment Services in Xero. 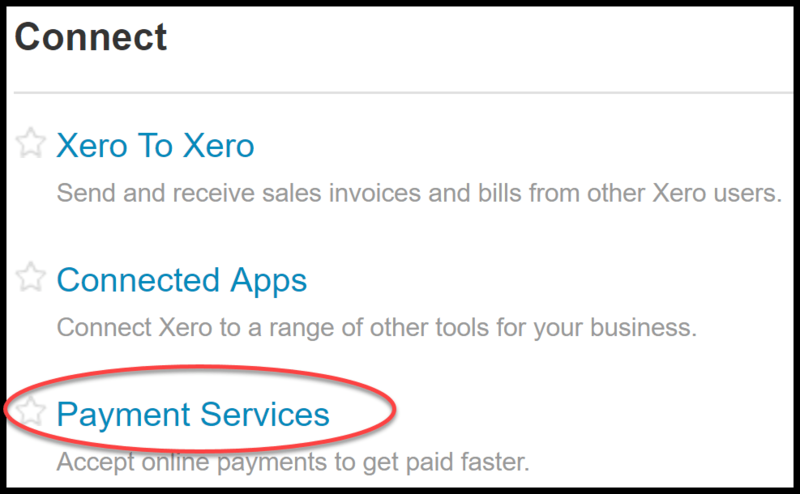 Click on the +Add Payment Service and you will see a list of payment services that you can connect to Xero. 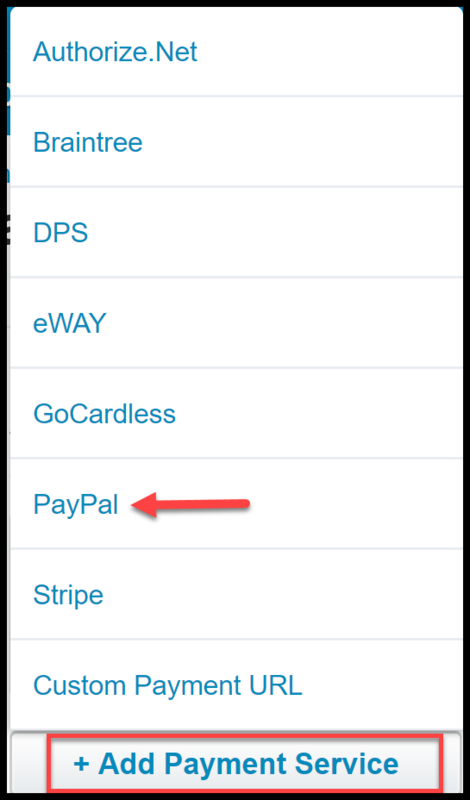 For our example, we will select Paypal as indicated in the screenshot below. Add a Payment Service to Xero so customer can pay their invoices online. Note: Depending on which Payment Service you have selected, the next few steps will vary. If you have an existing payment account with one of the services listed, be sure to have the user id and password that you use to access that account handy, so that you can just login instead of creating a new account. Follow the on-screen prompts to connect a Paypal account to Xero. Remember, this exact step will vary depending on which payment service you’re connecting. Generally, however, you’ll just need to enter your account user id and password. A. What email should PayPal use? – If you have an existing PayPal account, enter the email address that you use for that account; otherwise, enter the email address that you would like to use to set up a new Paypal account. B. In which bank account should PayPal transactions appear in Xero? – Xero will set up a new bank account called “PayPal”. If you would like to change the name of the account or if you already set up an account for PayPal in your chart of accounts, click the “edit” button to make the appropriate changes. C. Where should PayPal fees appear in Xero? – Similar to the bank account, Xero will also set up an expense account called “PayPal Fees”; you can click the “edit” button to change the name of the account or to select an account that you previously set up on your chart of accounts. D. Connect PayPal to Xero – Click this button once you have completed all of the above fields. 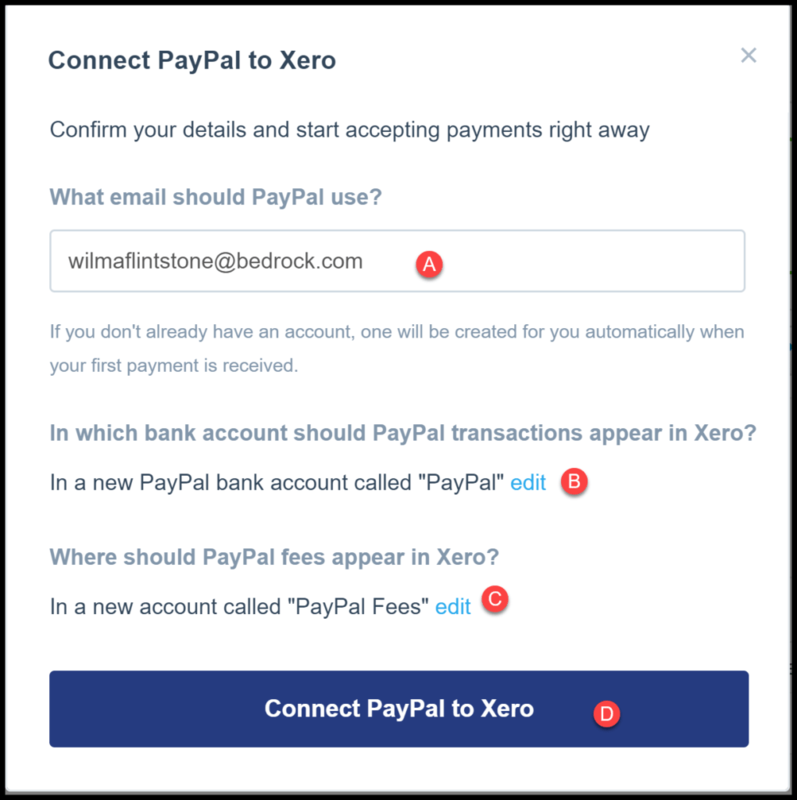 Note: You may receive an email from PayPal which will require you to confirm that you have set up a new PayPal account and/or connected it to Xero. In order for you to accept payments, you must respond to the confirmation email. How Do I Receive Online Payments? After you have successfully connected a payment service to Xero, you are ready to send your customers invoices that they can pay online. In the How to Invoice a Customer lesson, we showed you how to create & send invoices to your customers via email. Below is a sample invoice for our fictitious company, Acme Web Pros Plus. 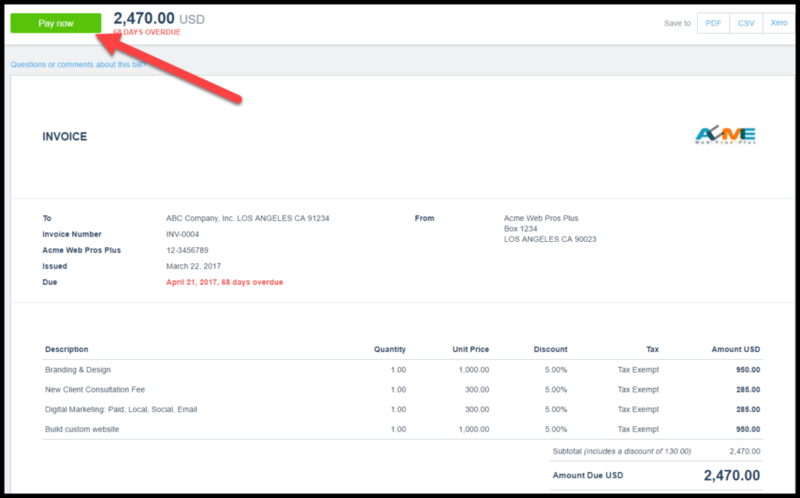 Note: Now that we have added a payment service to Xero, the “Pay now” button will appear on each customer’s invoice that you send via email. How Does My Customer Make a Payment Online? Your customer will follow the steps below to make a payment online. Step 1 – Click on the link in the email received from you with their Invoice attached. Customers can view and make online payments via a link in Xero. 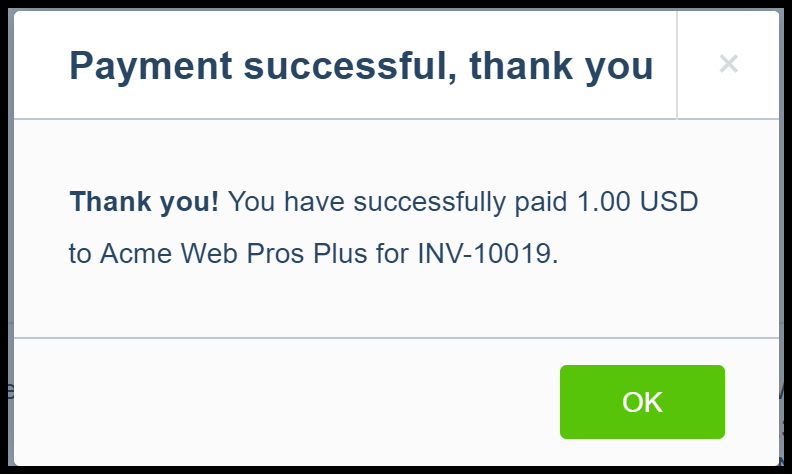 Step 2 – Click on the “Pay now” button. Customers can click the Pay now button and pay their invoices with a debit or credit card or their PayPal account in Xero. Step 3 – Follow the on-screen prompts to enter payment information. Below is a brief description of the information required for payments made via PayPal along with a screenshot. Required Payment Info to pay a Xero invoice with PayPal. PayPal Login: If your customer has a PayPal account, they can just click this button and login to their PayPal account to make their payment. Pay with a debit or credit card – If your customer does not have an existing PayPal account or if they prefer not to pay with that account; they can enter their debit or credit card information that they would like to pay with. Create your PayPal account – If your customer does not have an existing PayPal account, they can set one up by entering an email address and a password in the above fields. Once payment has been made, your customer should see a message similar to the one below. Note: Behind the scenes, Xero has marked the invoice as paid and reduced your accounts receivable balance by the amount paid. 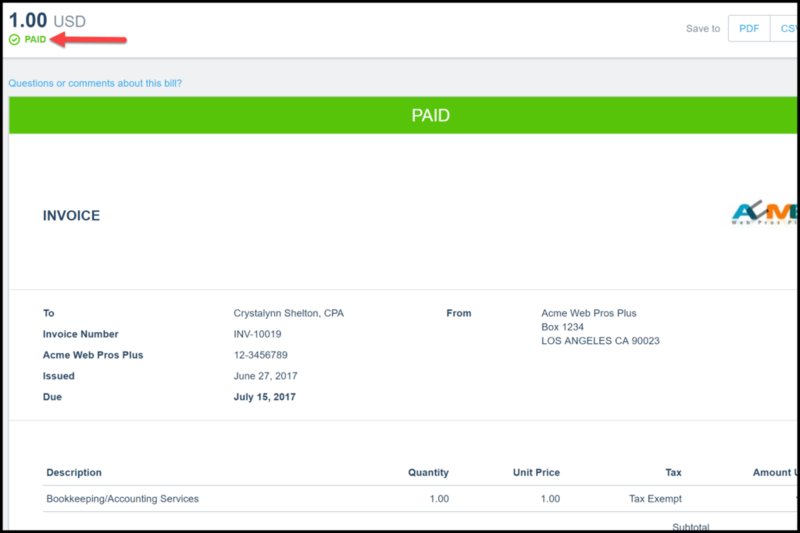 Your customer should also return to their invoice where they will now see a “Paid” stamp in the upper left-hand corner of the invoice as indicated in the screenshot below. Xero automatically marks invoices Paid once a customer has completed their online payment. Note: Your customer can print the invoice for their records or save it to their computer as a PDF or CSV file. That wraps up the section on how to accept online payments from customers. The next lesson in our Xero Training Course will be How to Reconcile Online Payments & Fees Received from a Credit Card Processor. In this lesson, we will walk you through how to record credit card payments and fees from credit card processors. To access this lesson or any of the others in the series, click here. For a free 30-day trial of Xero, click the link below. Crystalynn Shelton is a senior staff writer at Fit Small Business focusing on small business bookkeeping, accounting, and tax content. She is also an Adjunct Instructor at UCLA Extension where—for eight years—she has taught hundreds of small business owners how to set up and manage their books. Crystalynn is also a CPA, and Intuit ProAdvisor where Crystalynn specializes in QuickBooks consulting and training. Prior to joining Fit Small Business, Crystalynn was a Senior Learning Specialist at Intuit for three years and ran her own small QuickBooks consulting business.